Which Came First, the Project or the Project Sponsor? There has been a lot of interesting discussion on the roles and responsibilities of the project sponsor in LinkedIn groups such as Project Sponsors. There does not seem to be a common understanding on what a sponsor’s responsibilities are, or even if a sponsor is required for a project. This leads to the question – can there be project without a sponsor? This would be the same as asking ‘can there be a television program without an advertiser or other funding’, ‘can there be foreign exchange student without a sponsor/host family’, ‘can there be sports team without a sponsor to help organize and get uniforms and equipment’? A project (television program, exchange student, or sports team) cannot exist if it does not have some who cares enough to give or raise money, get excited and brag about benefits and accomplishments, or be willing to work to help overcome obstacles. I concede that there may be a project, but it will be a project with very high risks. A project I would not choose to manage. Do projects need a sponsor? Yes. Do project sponsors know how to support their projects? Ah…now we are on to something. How many jobs did you find? My search resulted in many articles like this one as well as job descriptions that included working with project sponsors. Not so much on the job postings for project sponsors. Now try “project sponsor” curriculum. Did you find any college level courses in project sponsorship? Well I did find one single day program targeted to sponsors. I was very excited about that until I noticed they had no current course offerings on their calendar. Your sponsor is not likely to know what is needed to be an effective sponsor. Project Sponsor was something they were assigned or took on as responsibility of their job, but is not the job they studied for. This is where he needs your guidance. You are likely reading this article because you are interested in project management. You likely have experience and have education in managing projects, or plan on pursuing it. You are actively choosing to explore the project sponsor role in support of the project you manage. What title does your project sponsor hold with the organization? How did he get to be a sponsor? Did his career path include any formal experience or education in managing projects? Hopefully, this line of thinking puts your understanding in a different light. Congratulations if you are a project sponsor reading this post! You have taken a great step to becoming a top rate sponsor and providing the support your project needs to be successful. It is our job as project managers to communicate the needs of the project to our sponsors. I developed the following list of sponsor responsibilities by considering the Project Management Body of Knowledge definition and the examples of non-project sponsor examples above. Well, it is a good start anyway. What do you think? This article does not address the issues of the wrong sponsor assigned or the stubborn sponsor who does not buy in to the importance of these responsibilities. I will save those for another day. Hi Vicki, first of all, great graphic! A lot of us who worked in large IT departments had a model where the CIO was our sponsor, funding our projects and taking on the sponsor role. Our CIO was really the go-between to the “real sponsor” over on the client side. Is that a model you’re familiar with? Would appreciate hearing your thoughts on that flavor of sponsor relationship. Good question. I can spin out a whole other rant…I mean blog…on the assignment of project sponsors. I have seen the model you propose here. In one case the CIO was referred to as the Project Director. She was a layer in the governance between the project manager and CIO. I liked this approach in that it was keeping the sponsor role with the business executive who cared most about the outcome of the project. I’m not convinced this role is necessary and beneficial. I do agree the CIO should be within the governance, but she should not be a barrier between the project manager and sponsor. I would have serious concerns about a project where the project director and project sponsor were communicating directly without involvement of the project manager. This is something can resolved through defining the governance structure and roles early. Hopefully all players can agree to their roles and demonstrate the benefit of the role they have taken to support a successful project that brings business value to the organization. The other notable case, I was involved as a consultant providing business analysis. This organization had a standard of naming the CIO and business Division Director as the project co-sponsors. I grew concerned when I realized that I was not going to get audience with either of the sponsors and was discouraged from making direct contact by others involved in managing my contract. Getting a true understanding of the project objectives, deliverables, and risks was very problematic with different views coming from different people from the project manager to the lead technician. I started focusing on determining who cared most about the project. It was a unit manager, Alex. He had responsibility for working with the federal government and ensuring compliance with changing regulations. He had directed writing of the grant proposal that funded the project and had weekly telephone calls with the federal body overseeing the changes and other impacted organizations for broad coordination. Alex was the true sponsor in the this project, even if not by assignment. I included a recommendation in my post implementation report that the organization reconsider the assignment of project sponsors to better align with responsibility for the outcomes the project was designed to achieve. The project manager was supportive of this recommendation. This project would have gotten off to a much better start if we both could have focused our efforts in meeting business need as Alex defined it. My first goal in any project I take on now is to determine who the “real” sponsor is to start building a working relationship, rapport, and trust early in the project. Having the “real” sponsor as the assigned sponsor is much more straight-forward and less risky by having a common understanding across the project governance and development teams of these roles. This is a great discussion and I look forward to hearing more on your own thoughts and from others. Now this is a whole can of worms. It makes the chicken and egg conundrum look easy and in fact that one has been solved.Assuming one accepts evolution and genetic mutation. 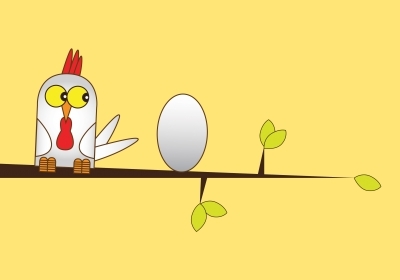 the egg came first as it was on the egg that the DNA for a chicken first appeared, from non-chicken parents. Thank you for the great response Ian. I’m glad the mystery has been solved!